We are proud to offer underwater photography courses in Bali and throughout Indonesia through our “Bali Academy of Underwater Photography”. World-renowned underwater photography instructors Mike Veitch and Luca Vaime lead our team of experienced instructors who offer a variety of courses based on individual need and experience; our photography workshops range from one day tune-ups to one week workshops. We are based full time in Bali, Indonesia and our specialty is working with underwater photographers who are interested in improving their skill set in a fun and rewarding environment. Bali is one of the best locations on the planet to scuba dive and is home to a large variety of underwater photography subjects: from large manta rays to the tiniest pygmy seahorses, Bali is home to almost every marine species in the Indo Pacific region. Our courses are custom made to suit the needs of all of our clients and we will communicate with our guests before their arrival in order to create a program that will improve the students photography in the most efficient manner. Our courses range from an intensive class aimed at introducing beginners to the wonderful world of underwater photography to more advanced courses which deal with specific sub genres of photography for more experienced shooters. With such a large range of underwater environments to choose from in Bali, we work with all of our students to perfect the skills they want to improve. Interested in more than just learning about photography? 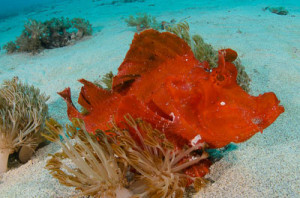 Not to worry, we know exactly what underwater photographers want on a scuba diving holiday and we will do our best to meet your every expectation. Our team of dive guides are trained and experienced to work with underwater photographers (and non photographers) and they understand exactly what experienced divers are looking for underwater. We follow a credo of “mature diving” and treat our guests as the experienced divers they are by respecting their wishes and creating dive plans that maximize time underwater. We only dive with small groups and always create personal groups for our dive safaris, we don’t combine different divers together on the same trip. 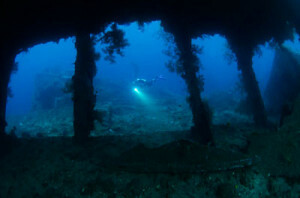 Therefore, if you are looking for a dive centre in Bali who will treat you like an individual and create a customized dive safari for you, then look no further than the Bali School of Underwater Photography. All of our students and courses are equally important to us and we guarantee you will experience top-notch photo instruction. What sets us apart from others is our desire to see YOU improve as quickly as possible. This means that we dive with each participant on a one on one basis with a slate in hand in order to concentrate on you 100%. I am a big fan of octopus, I would willingly spend an hour with a curious octopus watching it go about its daily life, combing its environment looking for food and avoiding predators. The species of octopus doesn’t matter; they all seem to have an innate curiosity of their surroundings and will often interact with a diver who moves slowly and carefully. One of my favourite octopus encounters was with this coconut octopus during a dive at Puri Jati (PJs) in north Bali, Indonesia. Coconut or veined octopuses, Amphioctopus marginatus, have recently been designated as the first invertebrate able to use tools, elevating their status as an intelligent animal. On this dive, I encountered this guy in less than 5 metres of water and was able to spend a long time watching and photographing his/her daily life. 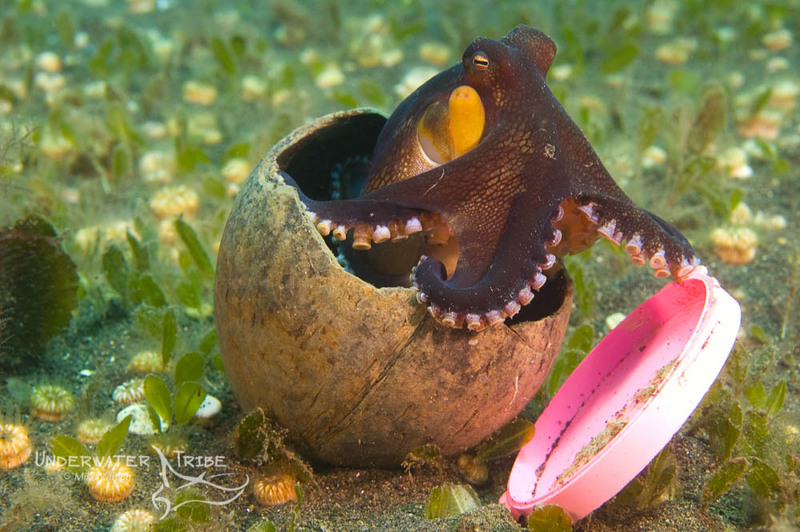 The first thing that stands out in the photograph is that the octopus is obviously using the coconut shell as a home (hence the name) but that the “roof” of the house is a bright pink plastic cap! This photograph pretty much sums up the intelligence of these animals and lends credence to the idea that they can use tools. 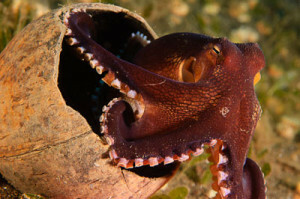 Not finding a suitable shell to use a “roof” to close up the shell when threatened, this octopus was able to substitute the next best thing it could find. Thinking I would help out this little guy and find it a clam shell to use instead of a piece of bright pink plastic, I found a big clam shell and brought it over, but when I set it beside the octopus it showed no interest whatsoever! He/she was more than happy with its bright pink roof and just picked up its shell and trundled away!